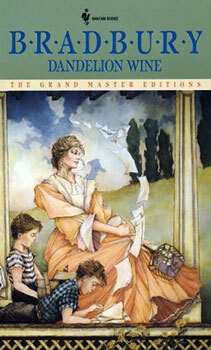 Dandelion Wine - Chapters Twenty-eight thru Thirty-one - Jimmie Aaron Kepler, Ed.D. Bill Forrester, with Douglas at his side, orders lime-vanilla ice at the soda fountain. His unusual request catches the attention of ninety-five year old Helen Loomis who invites him to visit her house tomorrow. Bill complies, and he and Helen start a friendly conversation about the appearances people keep up for each other, that soon diverges into Loomis acting as a “Time Machine” similar to Colonel Freeleigh to transport Bill into the pyramids of Egypt. Bill comments on how comfortable he feels talking to her, and Helen replies by reminding him that she’s only an old woman. While lounging in his chair, Bill attempts to envision her as being young again; he succeeds for a moment in seeing “the swan,” which he unintentionally says out loud, strangely disquieting Helen. The next chapter shifts back to the viewpoint of Douglas, who asks Tom on how come Mr. Forrester and Mrs. Loomis did not get a happy ending, as in the movies. However, the boys’ attentions are quickly distracted from the subject when they arrive at Summer’s Ice House, and turn to the legend of the Lonely One in the town, acting as an introduction to the next story. In the expository chapter, it is revealed in the conversation between Doug, Tom, and Charlie that Lavinia killed the Lonely One by stabbing him with a pair of sewing scissors. Charlie berates Lavinia for killing off their main source of thrills, but Tom convinces him that the actual Lonely One is still alive because the man they took in looked like “a plain, everyday man who wouldn’t pull the wings off even so much as a fly,” instead of the tall, bulgy-eyed monster they think he should look like. Neither of them listen to Douglas who says that he was at the ravine at that time and witnessed Lavinia discovering Elizabeth’s body, and thus can no longer treat the Lonely One as just an amusingly scary figure.